The Latin music star was scheduled to appear in a California court over the case, but now has found a resolution. Latin music superstar Luis Miguel has settled a court battle over a $1 million debt he was ordered to pay his former manager. Miguel, whose full name is Luis Miguel Gallego Basteri, had been scheduled to appear Thursday in a Los Angeles federal court. But in court papers filed Wednesday, attorneys for both sides said a settlement was reached so the hearing was canceled. The settlement with former manager William Brockhaus follows the five-time Grammy winner's brief time behind bars on May 2, when he was arrested for failure to appear at court hearings and released on bond the same day. This isn't the only legal trouble the Mexico native is facing. The "Sueña" singer is also battling fellow musician Alejandro Fernandez for backing out of a joint tour last year. Mexican singer Luis Miguel was arrested on May 2, 2017, after repeatedly failing to appear in court. The singer is being sued by his former manager, who claims that he is owed over $1 million in commission and interest. This is not the only legal trouble for Miguel, who is also being sued by fellow singer Alejandro Fernandez for backing out of an announced joint tour, and Warner Music, his record label, who allege the singer owes them for a $4 million loan. Miguel’s record label Warner Mexico is also reportedly suing the singer, according to People En Espanol. In a lawsuit filed in March 2017, Warner Mexico accused Miguel of failing to pay back a nearly $4 million loan from 2014. It was not immediately clear why the company loaned him the money. Miguel is one of the biggest stars in Spanish-language music, playing sold-out concerts across Latin America and Europe. His nickname is "El Sol de de México" (The Sun of Mexico). Miguel has sold more than 100 million records worldwide and enjoyed a successful career in multiple genres, including pop, mariachi, ballads and boleros. 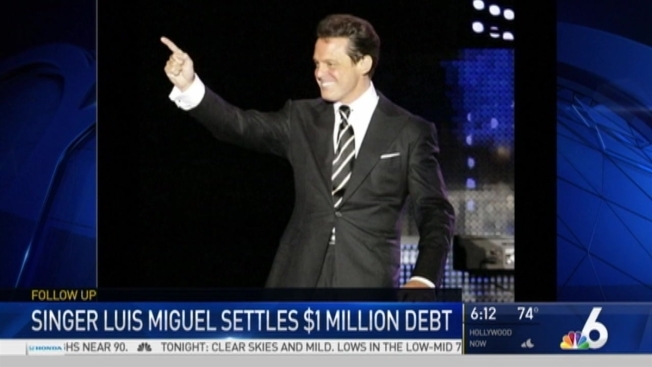 Latin Singer Luis Miguel Released Following Arrest in L.A. He was the first Latino artist to have two Spanish-language albums, "Romance" and "Segundo Romance," go platinum in the U.S. In 1995, he was the only Latin artist invited to sing at Frank Sinatra's "80 Years My Way" tribute after recording a duet with "Ol' blue eyes" a year earlier. The Latin crooner's love life has also garnered headlines. He dated singer Mariah Carey for nearly three years after meeting in Aspen in 2001, and had a on-again, off-again relationship with actress Sofia Vergara over several years in the early '90s. Miguel was also linked to former MTV host Daisy Fuentes. The couple dated for three years before breaking up in 1998.